Today's managers waste an estimated 40 per cent of their time on unnecessary cooperation, communication and control. Old-fashioned management skills are too expensive and slow to use in today's complex companies. When great companies grow they become more complex. This complexity starts to undermine what made the company successful: the organisation slows down, it is more difficult to get things done and it becomes a less satisfying workplace. In his work with talented people from hundreds of the world's leading companies. Kevan discovered that they spend over 80 per cent of their time on cooperation, communication and control - and that up to 50 per cent of that time is wasted. Organised around 4 Cs - Cooperation, Communication, Control and Community - Speed Lead distills the experience of more than 35,000 people in over 200 of the world's leading companies. 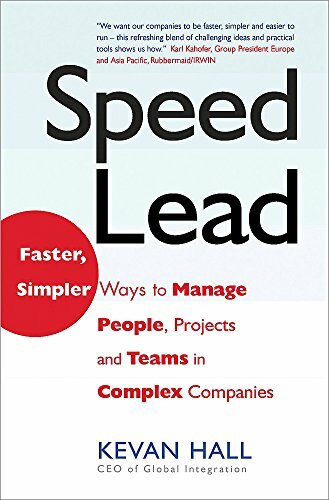 The resulting radical view has enabled organizations to unravel the spaghetti of complexity, reduce project cycle times, build closer business relationships and curb the costs of unnecessary travel. Contrary to current leadership wisdom, Speed Lead advises to: celebrate the end of teams where you don't need them; abolish meetings of the bored; take control of the "crack-berry" and don't be a 24-hour control freak; expect more from your people and lead a lot less; make "good-enough" decisions; and, don't let diversity be a diversion - share practices, not values.